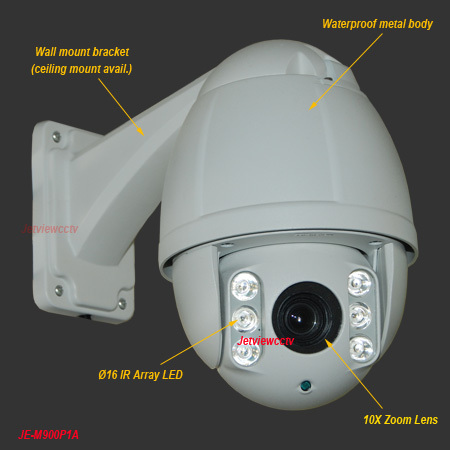 Jetview JE-M900P1A is a professional grade megapixel IP network camera with 1/2.7" progressive CMOS sensor, 10X optical zoom lens, 4.5" mini size high speed dome body and full-featured PTZ functions. It can cover wide area with PTZ and deliver the stunning HD resolution image (1028x720 or 720p). JE-M900P1A is suitable for both indoor and outdoor applications, especially the locations where the space is limited and requires the HD surveillance solution. It is an excellent option for new installation site or replacing the existing traditional analog low-resolution cameras. 220 presets, 4 guard tours, adjustable dwell preset, 16 guard points, etc. Built-in heater & blower for extreme operating temperature -40°~ +60°!